After a long Thanksgiving hiatus (in which I splurged at the outlets in Sonoma) I should now be focusing on Christmas shopping on other people instead of myself, but that's kind of hard to do with all these enticing sample sales going on. 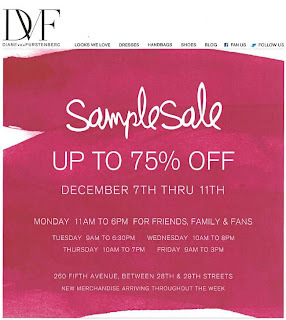 The DVF sample sale is coming up this week, along with James Jeans. James Jeans samples from $15-$50? How can I not check that out. Hayden-Harnett and The Collective Showroom are also having a 40-80% off sale. I recently bought a leather wallet from them at Lucky Shops, and wonder if their bags will be reduced even further. Worth a look! Clothingline is having a Theory sample sale through December 9th. Shop this Monday-Wednesday from 11 a.m. to 7 p.m. The selection will include current fall merchandise for women - tees, knits, blouses, pants, dresses, blazers, leather & more. There are so many sales this holiday season. I'm a petite looking for some new nice dress shirts for the winter. I have found some really nice shirts for petites here.